They might be, as Paul Krugman puts it, merely “pieces of paper to soothe the big man’s temper tantrums”. But when that “big man” is the President of the United States, and the “pieces of paper” are his plans to overhaul the tax system, it probably still merits some attention. Ever since his inauguration, Trump has been circling the issue of tax reform; at one point he appeared to warm to a proposal called the “border adjustment tax” (which we argued was too complex here). Then, on 26th April, the White House published a single piece of paper detailing the President’s intention to drop the idea of border adjustment, in order to focus on a simpler, but still radical set of reforms. The central pillar is a cut in the headline rate of corporation tax from 35% to 15%, which, at a stroke would take the US from having the highest rate in the G20 to the lowest. He is also proposing to simplify the income tax system so that the current seven bands are replaced with just three (10%, 25%, and 35%), remove the Alternative Minimum Tax (a special tax meant to prevent individuals or corporations from paying too little through overlapping exemptions) and abolish the estate tax (America’s version of inheritance tax, which collects fairly little revenue as the threshold below which estates are exempt is much higher than in most other advanced countries). Despite being sketchy, the new plan has attracted some, perhaps surprising, supporters. Tyler Cowen, of George Mason University, focusing on the cut in corporation tax, has praised the reforms. He argues that even if the cuts are financed through borrowing, if firms invest the cut, then the returns will outweigh the cost of finance. As I understand it, Cowen means that if there are no profitable investments for US firms which yield a receive a return above 2% then the tax plan wouldn’t work, but the US economy would need a massive set of structural reforms instead. Noah Smith, an economics writer for Bloomberg, also supports the Trump proposals to cut corporate taxes. Smith points out that corporate taxes are sometimes seen as a ‘free lunch’ by politicians – somehow raising revenue without harming the incomes of voters. But, as Smith argues, their cost is inevitably felt in either higher prices or lower wages; so on that view cuts in corporate tax should raise the real incomes of workers. He also cites some academic papers (for instance, this and this) which suggest that corporate tax cuts should increase rates of investment. But, crucially, he points out that in the current system many firms don’t pay the headline rate anyway, either because of loopholes in the law, exemptions, or complex avoidance methods such as transfer pricing. As a result, the share of profits actually being paid in tax has declined (see chart). A cut in the corporate tax rate would reduce the incentive for avoidance and lower business costs, while also lowering barriers to entry for new firms. 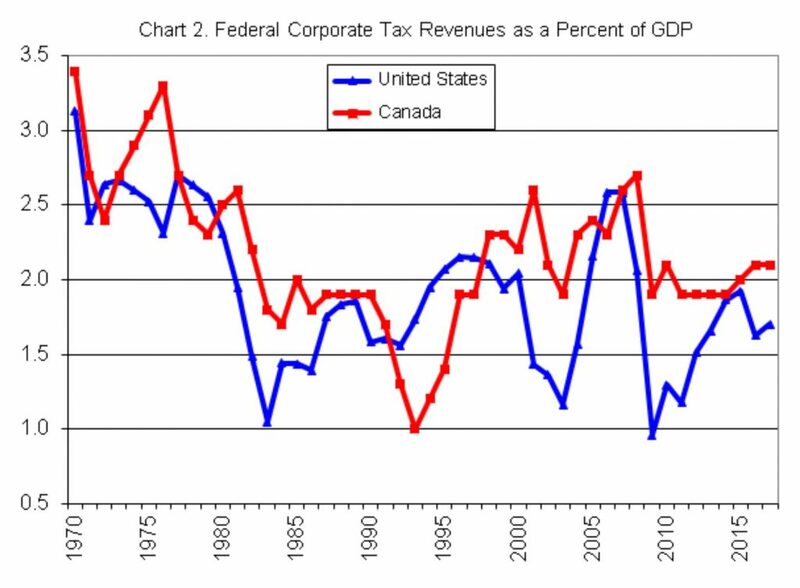 On the issue of whether the tax cut will lead to lower revenues and more borrowing, Chris Edwards, of the Cato Institute, a think-tank, has had a look at Canada’s experience of corporate tax cuts. 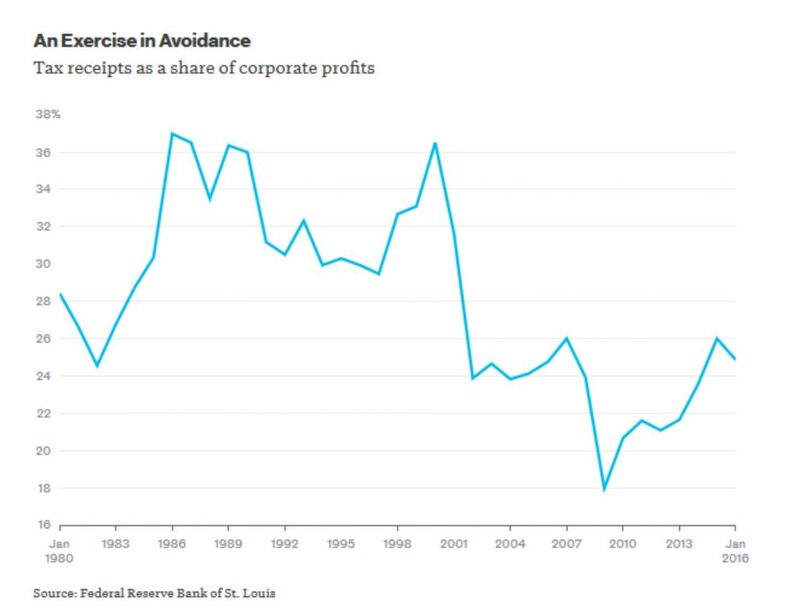 Overall, since they began cutting corporate taxes in the early 1990s (also from about 35% to 15% now), corporate tax receipts, although volatile, have not fallen significantly, stabilising at a somewhat higher level than the US which has had a much higher headline rate (see Chart). Unless Canada has been benefiting from US firms relocating north, this is strong evidence that a big cut in the corporate tax rate might even pay for itself. Trump’s tax plans are obviously not the finished product. But since they will almost certainly be amended as they work through Congress, their provisional nature might even be an advantage. A simpler tax system with a lower rate of corporation tax would probably benefit the US economy, without bankrupting it. But the cut in corporation tax is just one element of a much bigger package of tax cuts, including the abolition of the Alternative Minimum Tax and the estate tax, which are much more dubious. If the reforms become a trojan horse for ad hoc tax breaks for rich individuals or corporate owners (including Trump himself) then they will only worsen inequality and fail to boost growth. Luckily, as others have pointed out, Trump will almost certainly need Democrat support to get any tax package passed in the Senate. If the Democrats can amend or remove the worst aspects of the plan, the US might yet emerge with a tax package worth implementing.